Most residents of European cities breathe noxious pollutants that exceed international health standards, says a study released today (24 September) by the European Environment Agency, giving ammunition to health and environmental groups that demand far tougher EU standards. While some of the European Union’s deadliest air can be found in Bulgaria and Romania, few urban areas escape unhealthy pollutants such as particulate matter, ozone and nitrogen. Transport, energy and agriculture are the main culprits. Jacqueline McGlade, EEA executive director, said in releasing the report that economic inefficiency and the failure of many EU countries to meet their binding commitments to reduce pollution had both health and economic consequences. “Almost one-third of Europe’s city dwellers were exposed to excessive concentrations of airborne particulate matter,” McGlade said, adding that many EU countries were failing to meet commitments to improve air quality. The EEA 2012 Air Quality in Europe report shows that in addition to high levels of particulate matter – smoke, dirt and dust as well as metals and toxic vehicle and industrial exhaust – some 17% of urbanites are exposed to high levels of ozone, the ground-level cocktail of pollutants that causes smog. But the figures underscore the large gulf between what existing EU law and the World Health Organisation consider to be unhealthy. When the far more stringent WHO limits are applied, the figure for EU city dwellers rises above 80% for particulate matter and 97% for ozone. The EEA report also shows 7% of urban residents are exposed to nitrogen dioxide levels above the EU’s recommendations. Nitrogen and ozone levels affect more than human health, damaging vegetation, soil, water and even buildings, experts say. Poor air quality has widespread human health and environmental effects, contributing to respiratory problems, damaging plants and contributing to corrosion of buildings. Some studies say bad air causes nearly 500,000 premature deaths per year in the EU – 0.1% of the bloc’s population – while the EEA contends that shifting to electric vehicles and other anti-pollution measures could cut the toll to 230,000 by 2020. McGlade said there are economic consequences as well, estimating that the pricetag for bad air is €630 billion for health care €169 billion in lost productivity. “In essence, we’re paying for inefficient facilities through our health,” she told in releasing the report at the European Parliament. The new report also shows that while some pollutants remain stubbornly high, there has been headway in cutting emissions. Levels of sulphur dioxide (SO2), one of the most pernicious pollutants for human and ecological health, have plummeted 82% since 1990 thanks to more stringent smokestack scrubbing requirements. Carbon monoxide (CO) fell -62 %; non-methane volatile organic compounds (NMVOCs), –56 %; nitrogen oxides (NOx), –47 %; and ammonia (NH3), –28 %. Emissions of fine particulate matter have fallen by 15 % since 2000. In a further bid to reduce pollutants, the European Parliament recently approved legislation to slash sulphur levels in shipping fuels, a move environmentalists say will help prevent thousands of premature deaths especially in coastal areas. The new measures put the EU in line with the upper limit of 0.5% sulphur content in fuels set by the International Maritime Organisation and will apply in principle to all EU seas by 2020. The previous limit was 3.5%. 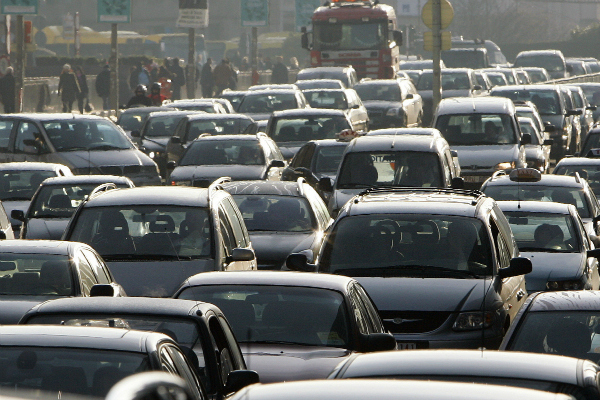 The EU environment agency’s recent studies show air quality challenges across the EU. Some of Europe’s wealthiest countries – including Austria, Denmark, Finland, Germany, Luxembourg and Sweden – exceed international ceilings for leading sources of pollution. Middle-income nations like Poland, the Czech Republic, Slovakia and Hungary – which have a high dependence on coal, industrial output or older industrial operations – continue to lead the EU in sulphur emissions. Janez Poto?nik, the EU environment commissioner, acknowledged that many national governments were failing to address violations and that the Commission is taking infringement action to address non-compliance. Health organisations are pressuring the European Commission to keep this in mind as it prepares any revisions to the 2008 air quality directive that are expected by 2013. The European Environmental Bureau, a campaign group, is pressing for stricter guidelines on pollution, in line with WHO standards. Particular matter 10, or PM10 (smoke, dirt and dust form coarse particles): WHO annually, 20; EU, 40. Carbon monoxide (CO): WHO and EU, 10 for an 8-hour period. While environmentalists call for further steps to improve air quality, efforts to cut pollution can be politically complicated. For example, EU policies that encourage the use of diesel engines to cut greenhouse gas emissions contribute to higher nitrogen levels. In addition, most EU countries have spotty records at enforcing the European Commission’s 2008 air quality directive. Pressure to create economic growth in the face of the finance and sovereign debt crises, and receding economies, creates pressure to overlook policies that might crimp growth. Last year, the UN Human Development Report showed that Bulgaria leads Europe in the intensity of air pollution, ranking in the top one-quarter of the most polluted of the 187 countries in the report. Romania and Bulgaria are also global leaders in mortality rates from poor air quality – 439 deaths per million people compared to 437 in Bulgaria. Worldwide, only Armenia has a higher annual mortality rate than the two EU countries – 882 per million population in a country of 3 million people. Jacqueline McGlade, EEA executive director, said in a statement: "European Union policy has reduced emissions of many pollutants over the last decade, but we can go further. In many countries, air pollutant concentrations are still above the legal and recommended limits that are set to protect the health of European citizens. In fact, air pollution reduces human life expectancy by around two years in the most polluted cities and regions." Air pollution has different particulate matter (PM) components – smoke, dirt and dust form coarse particles known as PM10, and metals and toxic exhaust from smelting, vehicle exhaust, power plants and refuse burning forming fine particles called PM2.5. The 2008 air quality directive aimed at streamlining and tightening EU legislation dealing with pollution and air standards. It is due to be revised by 2013, and Environment Commissioner Janez Poto?nik seeks to consolidate many different EU regulations on air quality and pollution into a single law. The 2008 rules set targets for reducing concentrations of fine particles that health officials say are dangerous pollutants for human health and that contribute to respiratory, sinus and other problems. Under the directive member states must cut exposure to fine particulate matter by an average of 20% by 2020, based on 2010 levels. Many of the policies grow out of a 2005 strategy on air pollution, which sought to cut sulpher dioxide (SO2) emissions by 82%, nitrogen oxide (NOx) emissions by 60%, volatile organic compounds by 51%, ammonia by 27%, and primary fine particulates by 59% compared to the levels of 2000. Health advocates says the cost of cutting emissions through better smokestack scrubbers, cleaner-burning vehicles and a shift to renewable fuels would be more than offset by savings in treating complications of bad air. 2013: 'Year of Air' as declared by Environment Commissioner Janez Poto?nik.